With two sets of mining head gear, an array of mining lamps, some rather exquisite rugs and two projection screens, Public Service Broadcasting took to the stage for a seventeen track set that was sequenced to perfection. David Bowie's 'Sound And Vision' and their very own polite public service broadcast about mobile phone usage headed up the set. J Willgoose esq was first out as he eased us into the night with the title track from their last album, 'Every Valley'. Aided in part by the rich and emotive voice of the tremendous Welsh actor Richard Burton, there was a theatrical drama that enveloped the performance of each track. With the rise and fall of each of the suspended lamps came a palpable tension as PSB's history lesson was played out in it's own unique way before us. The balance of the set was practically seamless (No pun intended!). "As the cage dropped suddenly into darkness the working day had begun" rang out as the stark realities of working underground were projected on the screens to intensify the atmosphere of 'The Pit'. 'People Will Always Need Coal' completed the opening triple salvo of tracks before the mood was lightened by the 'Theme From PSB'. WH Auden's masterful poem provided the inspiration to 'The Night Mail'; "Letters for the rich letters for the poor, the shop at the corner and the girl next door'. 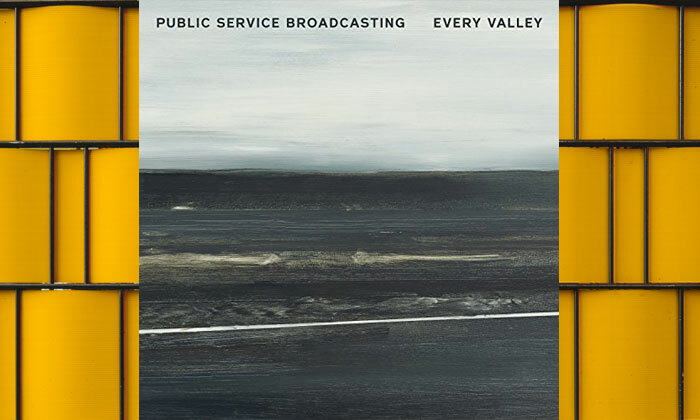 The undeniable brilliance of the metre in this poem alone is enough to let you appreciate the song but when coupled with PSB's soundtrack it elevates it to a whole 'nother level. 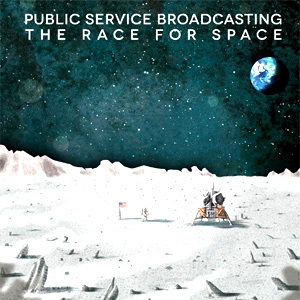 Mid-set saw Public Service Broadcasting step back to 2015's breakthrough album 'The Race For Space' as at first 'Korolev' and then 'E.V.A' were delivered with the adroit artistry of musicians and performers completely at one with their material and their crucial role within the performance. The continually changing guitar selection of Willgoose was astounding but he didn't just restrict himself to merely that. He looped soundbites, played keyboard, electronically communicated with his audience in a playful manner and alternated between innumerable effects pedals throughout the evening and all with the consummate ease of an artist at the top of his game. PSB revisited the mines of Wales for the second time of the evening with the Tracyanne Campbell backed first single lifted from their latest album, 'Progress', and then the emotionally charged, 'They Gave Me A Lamp'; both providing an alternative glimpse into a not too distant, distressing, past. The preparatory authoritative advice of the suspenseful and dramatic, 'If War Should Come' was the only place to go as PSB played out the first three tracks in order off of their first five track E.P. JF Abraham's horn accentuated the first track, and his sub-tectonic bass 'London Can Take It', before JW took centre stage with an electrifying guitar solo on 'Spitfire'. As the night neared its end, the band returned to space with at first 'The Other Side' and then a pumped up take on crowd favourite, 'Go', the latter providing the only sing along opportunity of the night with chants of go and stay ringing out around The Hall By The Sea. After a brief break "to step out and get some fresh air" the second apology of the night came as PSB returned to the coal face and to the stage. JW esq dedicated his first song of the encore, 'All Out', to the Orgreave miners but also acknowledged that he hadn't, until now, realised the plight and isolation of the Kent miners during the strikes. Follow up 'Gagarin', replete with dancing cosmonauts, was a highlight of the evening before the band wrapped up the night with an assent on 'Everest'. 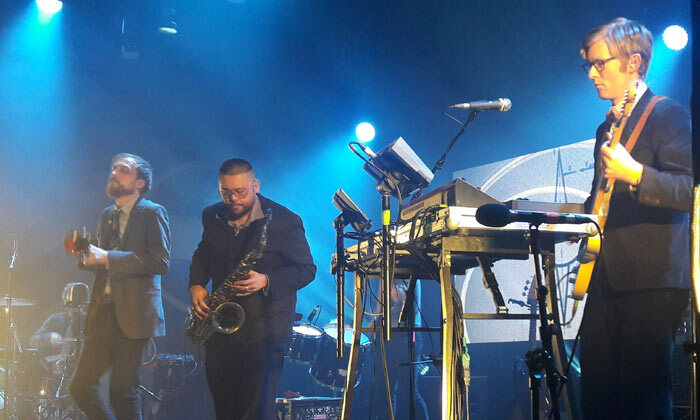 PSB's first headline gig in Kent may have been a long time in coming but it was worth the wait in the end. The support set was a triumph and the PSB show itself was like a piece of performance art with its rigging, theatrics, lighting, sequencing and musicianship. Aided and abetted by a very entertaining and lively brass trio Public Service Broadcasting put on an extremely entertaining performance that is unlike any other.